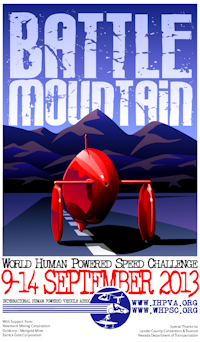 The 2013 World Human Powered Speed Championships at Battle Mountain, Nevada was held from 9/9 through 9/14. On the last day of the event Sebastiaan Bowier of the Netherlands pedaled the Delft Velox 3 to a new 200 Meter world record speed of 83.13 MPH! Check out the WHPSC site for all the results and pictures from the race week!